North Somerset Council has revealed plans to recruit a new permanent chief executive and head of finance at a cost of more than £250,000. 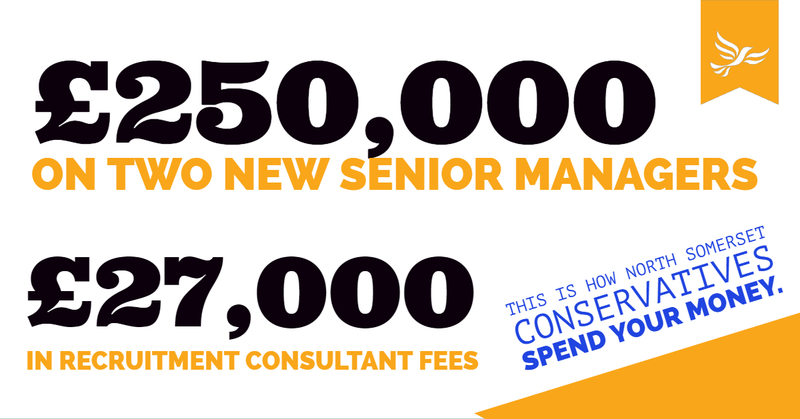 The Conservative-run council has also appointed specialist recruitment consultants, at a cost to taxpayers of £27,000, to advise them on the process. Councillor Mike Bell, Leader of the opposition Liberal Democrat Group, said: “Local taxpayers will be shocked to learn that, despite promises of a senior management review to cut spending, the council is pressing ahead with recruiting new top managers at a cost of a quarter of a million pounds. “However, it is the payment of £27,000 to recruitment consultants to tell them how to compile a job advert and recruit the right staff that I find appalling. This is more than many local people earn in a year and is an insult to residents who are told there is no money to empty bins, clean our streets or repair our roads and pavements. A report on the recruitment will be considered by the council’s Employment Committee next week and details can be found in the links below. Does the council not already have an expensive HR department capable of recruitment ? I’d like to see the annual cost of hiring in ” consultants ” as it seems that is all we hear about, consultants for just about every decision the council have to vote on ! As for street cleaning don’t get me started, the estate where I live, The Coronation, is sporting floral displays (weeds but very pretty ) in every gutter, pavement crack and drain that puts even the floral clock to shame !! Spending this amount of money on consultants is disgusting. Where are out street cleaners. Neva Road is the dirtiest road I have ever seen anywhere. Rubbish is strewn everywhere and never cleaned up. Its all very well making Weston a more pleasing place for residents and visitors to live and visit, but please let us get some basic street hygiene sorted. This is where money should be going, not into the pocket of some useless consultant. This council need to address it priorities.